The current guideline-recommended paradigm of acute MI management (“STEMI vs. NSTEMI”) is irreversibly flawed, and has prevented meaningful progress in the science of emergent reperfusion therapy over the past 25 years. Dr. Stephen Smith, my mentor and co-editor of this post, has been saying this much more eloquently for many years in his “STEMI/NSTEMI False Dichotomy” lecture series, but this bears repeating and needs to be reiterated as widely as possible. 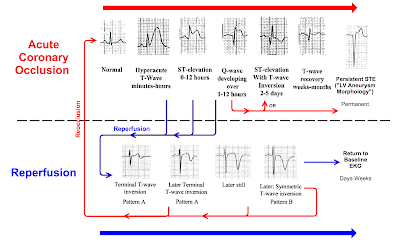 The STEMI-NSTEMI paradigm was the best idea available in 2000, when it formally replaced the Q-wave vs. Non-Q-wave MI paradigm.13 This paradigm shift was prompted by the Reperfusion Era, in which multiple large randomized controlled trials proved the efficacy of emergent reperfusion therapy.14 More specifically, nearly 60,000 ACS patients were randomized to thrombolytics vs. placebo, showing an impressive mortality benefit of NNT=56 for entire cohort given thrombolytics, despite the fact that 4 of the 9 trials had no ECG inclusion criteria whatsoever, and one-third of the patients had no appreciated STE. In the subgroup with undefined STE, lytics showed an even greater mortality benefit of NNT=43. This means that STE predicted ACO (and thus mortality benefit) better than not looking at the ECG at all. However, thanks to Dr. Smith and others we have learned a great deal about expert ECG interpretation since the 1994 FTT meta-analysis, and it turns out STE is no longer our best option for predicting ACO and therefore of the benefit from emergent reperfusion. To anyone who has spent time seeing patients and studying the ECGs and angiograms of acute MI, it is obvious why the STEMI criteria routinely fail in both directions. Foremost, ACO is a complex and dynamic process that doesn’t always manifest any ECG changes at all. 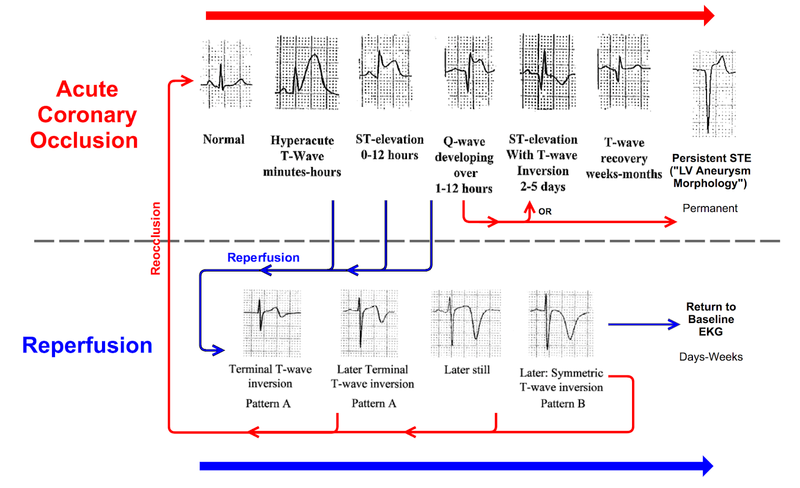 When it does manifest ECG changes, it is an intricate and time-sensitive progression of changes, exquisitely sensitive to reperfusion and reocclusion. The earliest stages of ACO (when the benefit of intervention is maximal) routinely do not show any STE. Even if you are lucky (or wise) enough to obtain an ECG during the ST segment changes, STE is always proportional to the size of the QRS complex, which may be very small in some territories with low voltage on the surface ECG such as the high lateral wall. Furthermore, not all ACOs produce STE, some result only in changes in the QRS or T-wave, or no ECG findings at all. This may be due to a variety of causes: time of recording (including during a brief period of spontaneous reperfusion), “electrocardiographically silent” myocardial territory, small myocardial territory, and low QRS voltage. Meanwhile, a huge proportion of controls without acute coronary syndrome have normal variant STE, or have abnormal depolarization (LVH for a common example) generating appropriate repolarization abnormalities which frequently meet STEMI criteria. The progression of ECG findings seen during acute coronary occlusion and reperfusion. In an attempt to spread this knowledge without challenging the deeply ingrained “STEMI vs. NSTEMI” paradigm, terms such as “STEMI equivalent” and “subtle STEMI” and “semiSTEMI” have been created and discussed for years in the literature. Sadly, these attempts have not produced widespread change in perception or management of acute MI except in the small groups of clinicians who have special interest in following such literature or the various FOAM resources that broadcast this knowledge. CONGRATULATIONS to Drs. Meyers, Weingart & Smith on an amazingly complete and superb compilation of information! Thank you for your great work! Thanks to God, that somebody has described it! Excellent presentation and evidence based as with all your posts. Let's hope this gets the recognition it deserves for us and our patients. Congratulations on producing a well-described alternative to STEMI and NSTEMI (not just the terminology, but the whole approach to diagnosis and treatment!). To understand that a patient with classic ACS-type chest pain with a 0.75 mm ST elevation in a lead with a 0.80 mm QRS amplitude deserves to have his/her myocardium preserved is a refreshing concept. I just wish we could get away from the terminology that implies we are treating "infarctions." How about OMI = "Occlusion Myocardial Ischemia?" Regardless, thanks to all of you for such a well-presented idea. If you need any assistance spreading the word, count me in! Another great idea. Whenever I give a lecture to students on EKG in MI, I show them a STEMI and say, "Well this is not necessarily infarction until the myocardium dies, and it sometimes does not end up with ANY infarction, and, if it does, it may be a LOT of infarction or a LITTLE. Others call ST Elevation ischemia "INJURY" but that term implies some irreversibility to it as well. So "subepicardial ischemia" is better, but then that is inadequate to the task as well because the vast majority of the time there IS actually infarction.......The reality is that this syndrome has such an enormous spectrum that no one term describes it well. 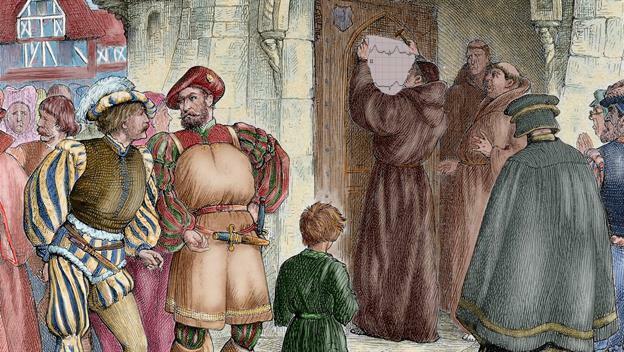 Thank you for your persistence of clear-headed reason in the face of near overwhelming dogma. I will be using this document as a reference in discussions with colleagues and trainees in the future. I realize that this manifesto is targeting patients with the clinical acute coronary syndrome. As an ICU physician, I am often faced with the dreaded "type 2 MI." Many a consult has recommended therapies ("the troponin is too damn high!") that I believe (based on the limited data I can find) are unhelpful at best and iatrogenic at worst. Any hope for a similarly well-cited compilation focused on the management of this common complication? Myocardial Infarction Type 2 and Myocardial Injury. Thanks for a wonderful document with a comprehensive review of the available literature. Definitely going to discuss this with our interventionalists. Are you conducting yourself or aware of any ongoing research/trial which study the benefit of early intervention in patients with NSTE-ACS with or without ECG-findings/refractory CP? We are just starting a retrospective study of ECG findings of NonSTEMI patients who have, vs. do not have, OMI. It is impossible to get a prospective study funded. Pius, you are not alone there!! You probably missed occlusions, but not MIs. They ruled in by troponin and did eventually get there angiogram and PCI, but could have gotten earlier (if you could convince the interventionalist). Is this just right bundle branch block?